You are purchasing (1) Snacking Box full of a variety of Snacks that were produced in outside the USA. The photos in this listing are of previous Snack Boxes we have sold, and may not be exactly what you receive. The Photos in this listing are to show you some of the items that may be included in your specific Snacking Box. Please let us know if you have any futher questions. Proudly USA Operated! 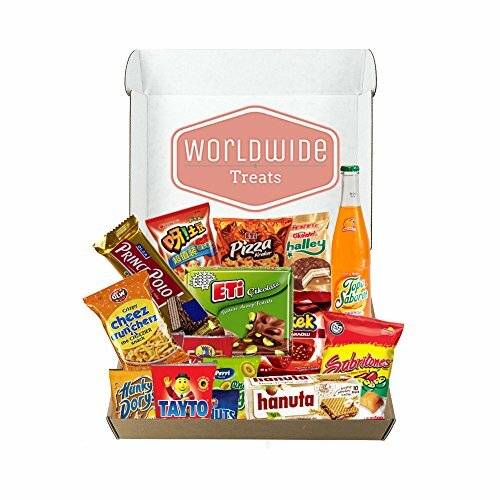 This is a Box full of pre-packaged Snacks from around the world! See more at the WorldWideTreats Official Site! Each Box can contain any combination of the following: Candy, Cookies, Chocolates, Wafers, Biscuits, Gummies, and more! Each Item in this Box is made in countries outside the USA to give you a truly authentic tasting experience! There may also be more than 1 item from any country, but never any duplicates. Each Box will contain at least 10 Snacks of any flavor, variety, and origin. You could taste Spain in one treat and Australia in another! The Photos are in this listing are not exact, but show you the types of items you may get. Every Box is different. If you have any questions about this product by Worldwide Treats, contact us by completing and submitting the form below. If you are looking for a specif part number, please include it with your message. Mexican Candy Variety Care Package by AtHomePlus (40 Count) --Perfect Gift for College Dorm, Military or Office! !